A glowing edge lit acrylic Statue Of Liberty light. It features innovative design of Statue Of Liberty with 100% engraving that carved on its Acrylic Glass (Perspex) to allow light flow. This also means that it does not contain stickers or paints of any kind. It is also cool, quiet and energy efficient at the same time. 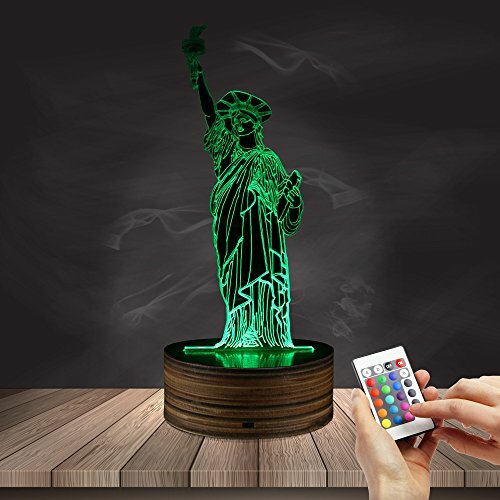 This product includes a Statue Of Liberty Desk Light, a 24 Key LED Remote Controller. The 24 Key LED Remote Controller require a CR2025 battery (included) to function. Also, its energy efficient LED lights has a long lasting lifetime of more than 50,000 hours. It is perfect for a desk decoration and also great as gift.